Republicans are unhappy about public perceptions of their tax cut. What happened was simple: they paid lots of attention to the business tax cuts and lots of attention to the tax cuts for this rich, but not so much attenton to the tax cuts for the working and middle classes. The middle classes, of course, pay the bulk of their federal income tax via withholding, and they don’t always notice small weekly changes. What they do notice is their tax refund at the end of the year. The Times article that Robert VerBruggen highlights below suggests that Democrats have been successful in misinforming the public about how many Americans have gotten a tax cut from the Republicans. But it’s probably not just political spin, or the design of that tax law, that caused people to underestimate the extent of the tax cut. Previous tax cuts have landed the same way. President George W. Bush, in his first term, passed two tax cuts that cut tax bills for everyone who paid income tax and raised taxes on nobody. In 2004, a New York Times/CBS News poll found that fewer than one in five Americans thought they had gotten a tax cut. So here’s the thing. As Republicans are fond of pointing out, about half of all Americans don’t pay any federal income tax. They’re students, or they’re poor, or they’re on disability, etc. Another 20 percent pay so little in taxes that tax cuts are virtually invisible. So right off the bat, somewhere around 70 percent of Americans really didn’t see any benefit from George Bush’s tax cuts. That’s not very far off the number in the Times poll. Roughly the same is true of the 2017 Republican tax cut. 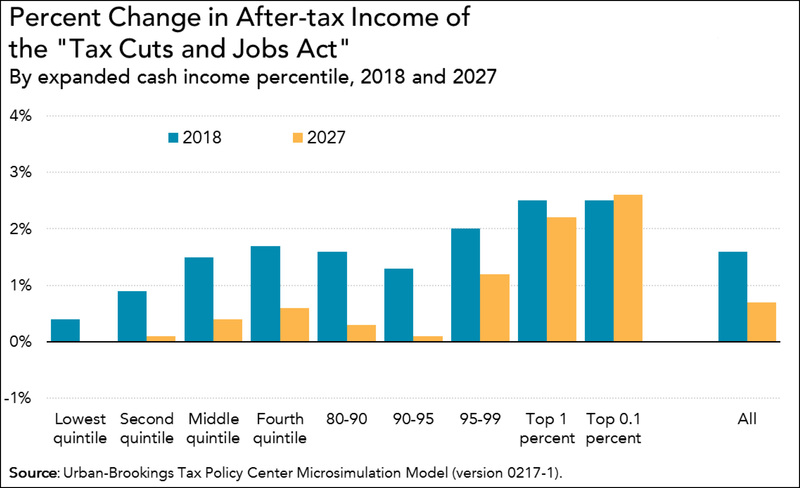 The working class saw a tax cut of less than 1 percent on average (second quintile in chart below). That comes to maybe $300, or about $6 per week. Is it any surprise that these taxpayers aren’t exactly brimming over with excitement? Republicans gave the working class (and the middle class) a temporary and minuscule tax cut while the rich got a big, permanent one. Then, because they don’t really understand the middle class at all, they futzed around with the withholding tables so that lots of people got smaller refunds. Then they wonder why ordinary people aren’t impressed. The answer is simple: it’s because they got close to nothing except a big surprise on tax day. Why would you expect them to be anything but resentful over that?